Intrigued by the "Indian Rubber Men" he saw at carnivals throughout his youth, Ralph Dibny spent years trying to learn their secret. Eventually he noticed that many of the contortionists liked a particular soft drink called Gingold. He isolated the key ingredient - the juice of a little-known tropical fruit called the gingo - and distilled it. By drinking this gingold extract, Dibny gained the ability to stretch any part of his body to fantastic lengths. Early in his career, he traveled to Central City, where a brief rivalry with the Flash became a lifelong friendship. 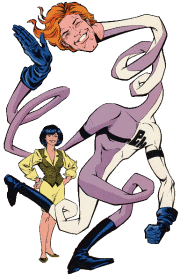 The flamboyant Dibny never seriously hid his identity, craving the attention (and the fortune) that came with being the "world-famous Elongated Man." He would have been very hard-pressed to keep his name secret after he married celebrity debutante Sue Dearbon. Ralph and Sue have spent much of their time traveling the world, solving mysteries in small towns, sometimes settling down when Ralph has joined the Justice League. They spent a great deal of time in Paris and London, since they both worked with the European branch of the League (he as a hero, she as an administrator) from the beginning of the team to its end. Not long ago, Sue was tragically killed in the couple's Opal City home (Identity Crisis #1, 2004). Ralph is presently on the trail of her murderer.